Rejoice this Navratri Season with full of joy. Just book a ride with Sai Tour & Travels, Chandigarh and get special 20% discount on every ride. We provide taxi service in Chandigarh, Kharar, Mohali and Panchkula. 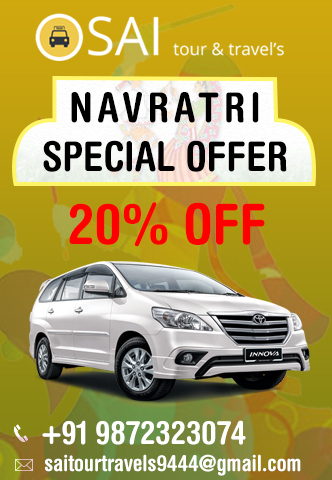 Take part in our huge discount festival this Navratri season with our 24/7 taxi service throughout the season. This offer is valid only for a limited period of time. To book a taxi you can either use our website or telephonic service. You can also submit your query on our website. enjoy your leisure time with all of your loved ones. We have a different number of packages based on user needs. We cover all the famous destinations of Chandigarh like Rock Garden, Rose Garden, Elante Mall, and Sukhna Lake Etc. We also cover the nearby places as well like Pinjore Garden, Parwanoo, Panchkula, Kalka etc.